A complex process called ‘gerrymandering’ helped the Republicans snag more seats at the midterms. Here’s how. YOU'VE no doubt seen the phrase "Blue Wave" a lot in the news these past few days. The term refers to a wave of Democratic support that was supposed to breathe new life into the American Congress. The Democrats gained at least 26 House seats and won the popular vote by seven points. It was certainly a win for the party, but it could have been greater had it not been for a questionable - but ultimately legal - decades-old process called "gerrymandering". Gerrymandering involves one political party strategically manipulating the electoral boundaries so it can land more of its own representatives into Congress. In Australia, this is not a thing - but we'll come back to that. Experts say the process has largely given Republicans a significant political advantage since 2010.
WHO GETS ELECTED TO THE HOUSE OF REPRESENTATIVES? Every state in the US is broken up into a number of districts. All in all, there are 435 congressional districts in the whole country, but each state has a different number based on how big its population is. California, for example, is the most populous state and is broken up into 53 districts. Hawaii, by contrast, only has two. Less-populated states such as Wyoming and Vermont have only one. GOT IT. SO WHAT'S GERRYMANDERING? The term "gerrymandering" originated in 1812 with a bloke named Governor Elbridge Gerry of Massachusetts, whose administration first enacted a law to divide new state districts in his favour. The word was published for the first time in The Boston Gazette on March 26 of that year, with a cartoonist depicting the boundaries as a salamander. Over 200 years later - boom! You're still reading about the term. Language evolution is wild. 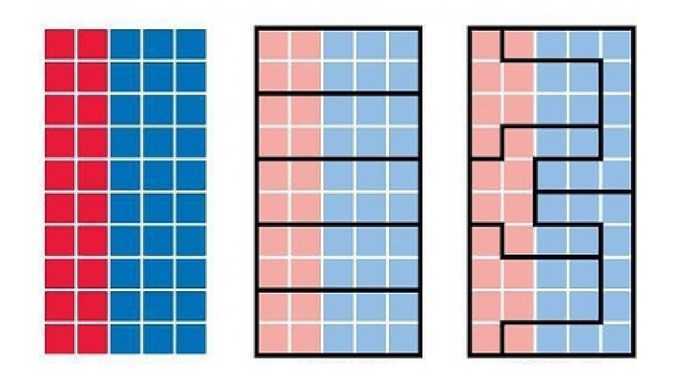 But to really understand what gerrymandering is, we need to look at how each state is divided up. Who decides where one district ends and another begins? District lines are drawn once a decade. The last time they were redrawn was in 2010. After the Republican Party lost to Barack Obama in 2008, each state legislature carved out new district lines that favoured the ruling party. 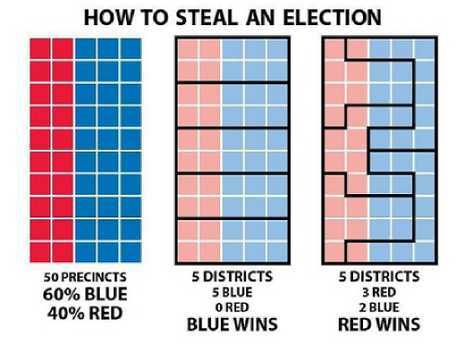 This graph perfectly sums up the process of gerrymandering. The first chart represents a hypothetical state. In this example, 60 per cent of the people living in this state are Democrats, and 40 per cent are Republicans. Now, say that state was given five districts. The second chart shows a clean, logical division of those districts and representatives. Basic mathematics dictates that three of those representatives would be Democrats, and two would be Republicans, yeah? Not so fast. The third chart reveals the sneaky part: those in charge of dividing where those geographical district lines are drawn have the freedom - by law - to be as creative as they like. As long as the district sizes are evened out, those in charge can define them however they wish. In the Republicans' case, they can split up the boundaries so that the Democratic voters are concentrated in one district - generally city centres - while the Republicans can sweep all the outer rural areas, which are more likely to vote in their favour. Through a bit of crafty line-work, we see in the third chart that the state can be manipulated to give the Republicans three representatives, and the Democrats only two - despite the fact that there's more Democrats than Republicans in the state overall. This goes to the heart of America's voting system: it's electoral, not popular - a move designed to ensure more attention to less-populated areas rather than just the cities, which attract more people. This in part relates to how Donald Trump won the 2016 federal election, even though his opponent Hillary Clinton won the popular vote. Some critics predicted a ‘Blue Wave’ would wipe out the Republicans at the midterm elections. It ended up being more of a ‘blue ripple’. According to George Rennie, a lecturer in US politics at the University of Melbourne, Republicans in particular have a history of using gerrymandering to their advantage. "The Republicans have historically done it more, held more state legislatives and have been much more prolific at it," he told news.com.au. While Democrats are guilty of it too in some parts of the country, he says it's not nearly as bad. "Some of the bigger Democratic-controlled states are taking more of a principled stand, like California." As a result, he said Democrats "suffered greatly from gerrymandering". "I think it cost them. 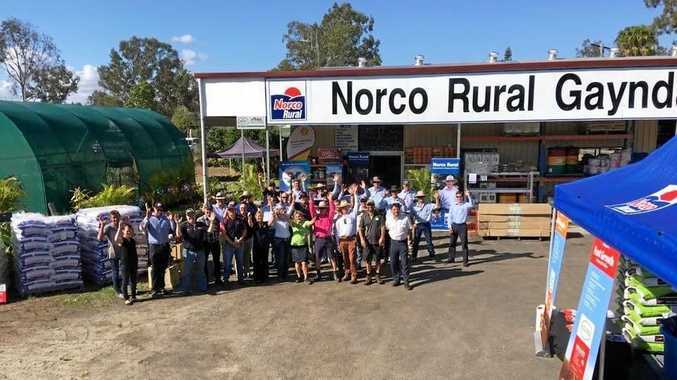 They can be a little more reluctant to get into the mud, and the Republicans are very happy to get into the mud, and they win in part because of that," Mr Rennie said. "It's the classic issue with districts - with gerrymandering you have a huge problem where Democrats have to win by 7 per cent, but winning by that amount barely gets them the majority. Whereas if the Republicans won by 7 per cent it would be an absolute wipe-out." One of the reasons for this is that across the country, Democrats tend to have clustered voters. How Americans voted in the midterm elections. THAT ALL MAKES SENSE … KIND OF. All right, let's apply this to one real-life state. Here's the state of Michigan. The division of Michigan by state. That looks a bit … random, doesn't it? It all appears to go horizontally at first, but suddenly District 4 is wedged between 2 and 5. Districts 11-14 are all kind of clumped together in the bottom-right corner, but look! That big patch above it forms District 10! This is not an accident. The lines are drawn by one party to give itself a political advantage in the congressional elections - AKA gerrymandering. 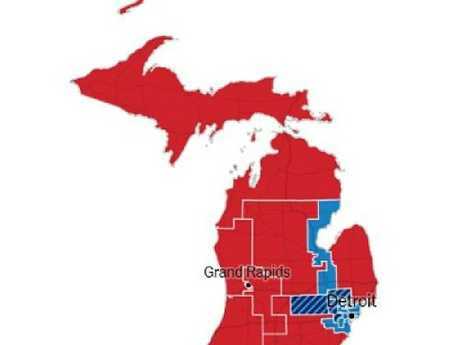 In Michigan, 2,167,893 - or 52 per cent of the state's voters - were Democrats; 1,918,277 - or 46 per cent - voted Republican. 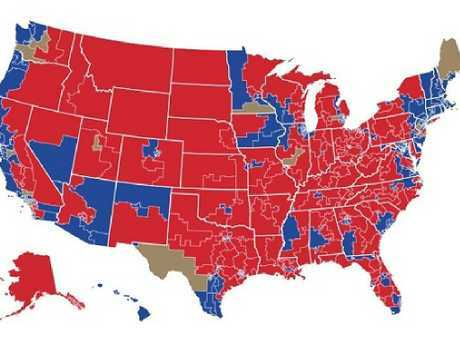 All things considered, that's a whole lotta red on that map. But despite this gap, both parties will send seven representatives to Congress. According to The New York Times, Michigan was one of four key states where Democratic candidates gained support from voters relative to 2016, but relatively few seats. Ohio, North Carolina and Texas were the other three. In Ohio, Democrats won 48 per cent of the popular vote, up from 43 per cent in 2016 - yet they only garnered four of the State's 16 House seats. In North Carolina, the Democrats gained almost 3 percentage points, but couldn't get any new seats. According to The Metro Times, Michigan's State House Democratic candidates received 175,000 more votes than their Republican counterparts - yet Republicans will hold a 58-52 majority in the State House during the next term. In the State Senate, the Democrats received over 115,000 more votes on the Republicans - yet the Republican Party will hold a 22-16 majority next term. The Republican Party will continue to control both chambers by a sizeable margin, with a 58-52 majority in the State House during the next term. TO WHAT EXTENT DID GERRYMANDERING IMPACT THE ELECTION? Mr Rennie said gerrymandering had a "pretty significant" impact on the results in this week's midterms. "Overall the Democrats suffered greatly from it," he told news.com.au. "And Democrats would be very keen for the practice to end. But again, you just return to this basic idea that Republicans are more likely to do it, and have done it for some time, because they control so many state legislatives." Mr Rennie said this was in part due to an excess of optimism. 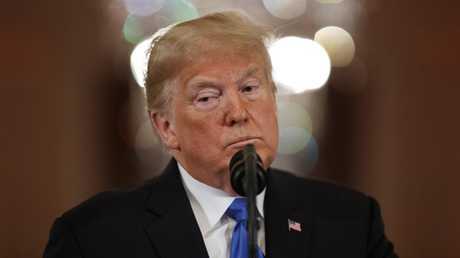 "(The Democrats) were getting some polls saying they were getting a fighting chance, but it didn't go as positively as they'd hoped," he said. "The talk of the 'Blue Wave', for instance - that's pretty optimistic, bullish language. There's this basic psychological issue where you start to dream of not just having a good night, but an amazing night, and it just didn't work out that way." 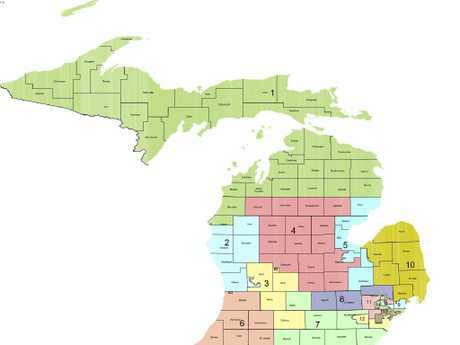 On Tuesday, Michigan effectively voted to minimise gerrymandering. 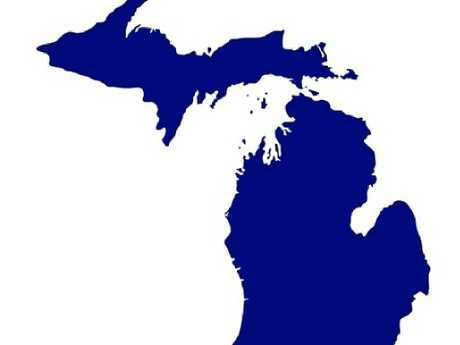 Over 60 per cent of Michigan's citizens voted in favour of a measure by which the state's political map will in future be drawn by a citizens commission made up of four Democrats, four Republicans and five unaffiliated voters. The aim is to restore balance; Michigan voters will select their politicians, rather than the other way around. The new commission is expected to first draw lines for the 2022 election, using population information from the 2020 census. But in terms of gerrymandering across the country, Mr Rennie doesn't see much change coming for the foreseeable future. "(Gerrymandering) is pretty ingrained into the US political system," he said. "The only way I can see it changing is if the Federal Electoral Commission gets similar powers to the Australian Electoral Commission, for example." The AEC is an independent body that outlines our representative districts. Under Australian law, you can't work for the body if you're a political party member. In the US, this law doesn't exist. And there's one simple reason you'll probably be waiting a while for it: "In order for the FEC to get those powers, you need the states to relinquish their prerogative in that case. "I just can't see that happening anytime soon."